Magic, danger and mystery. All the makings of a wild and wonderful tale – and Europe’s northern regions have plenty to get your cogs turning. Turn city breaks into troll safaris, countryside walks into mythical pilgrimages and seaside retreats into an adventure to the past as you explore the lands where Europe’s legends were made. All you need is a map and a little imagination. THE STORY: It was on 18 November 1307 in Altdorf, above Lake Uri, that Swiss folk hero William Tell refused to bow to the orders of an Austrian authority. He was forced to shoot an apple off his son’s head with a single arrow to save both their lives. In doing so fastidiously, and eventually killing the Austrian enemy with a second crossbow, Tell sparked the struggle for Swiss independence. Or did he? His legend – true or not – is cherished by the Swiss. 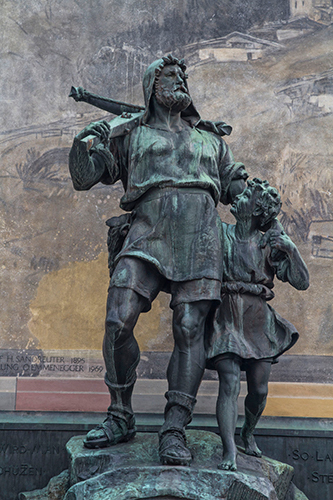 THE PLACE: Tick off Tell from your bucket list with a trip to his bronze monument in Altdorf’s famous square; the place of Switzerland’s origin. Uri’s main town has plenty to offer – hiking the Alps is recommended, if only to sample a glass of fresh mountain milk from the cheery farmers. For the full Tell pilgrimage, visit the chapel in Bürglen built on the site of Tell’s home, and don’t miss Tell’s Ledge – the very rock Tell sprang onto from the boat he was bounded to and escaped. THE STAY: Less than a 15-minute drive from Altdorf, Hotel Stern Post is as close as you can get to Gotthard’s halcyon days without actually owning a time machine. The building was one of Switzerland’s first post offices, dating back to 1788, and the roll call of former hotel guests includes Johann Wolfgang von Goethe and Hans Christian Andersen. The story: Some know him as Fionn mac Cumhaill, others Finn MacCool. His story has been told for generations: the Irish giant lived peacefully on the Antrim coast with his wife until he was taunted by Scottish giant Benandonner. To finally challenge his foe face-to-face, Finn built a causeway of huge stepping stones across the sea to Scotland (to keep his feet dry, naturally). Ireland’s famous giant outwitted the Scottish giant by appearing as a obscenely large baby, spurring the alarmed Benandonner to obliterate the causeway so that Finn could never return. The place: Legend says the result of Finn’s handiwork is Northern Ireland’s only UNESCO World Heritage Site – The Giant’s Causeway. 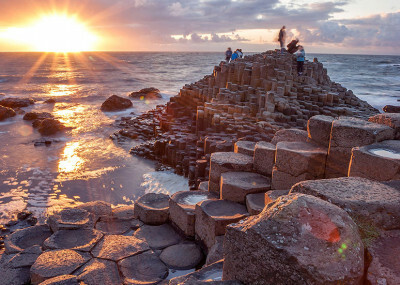 No photos can do the Causeway justice – when you see it, you’ll understand why the ancients thought it was the work of superhumans. With perfect hexagonal columns clumped together by the dramatic coastline, it’s hard to believe that this is a natural formation. It’s located between Portrush and Ballycastle – visit at dusk or dawn for the best photo opportunities. The stay: Escape the blustery coastline to the peat fires, secret snugs and warm welcomes at Bushmills Inn, just two miles north-west of The Giant’s Causeway. This 17th-century coaching inn is a cosy bolthole with its own whiskey blended by the world’s oldest distillery just down the road. Don’t leave without sampling the comfortably creamy cullen skink. 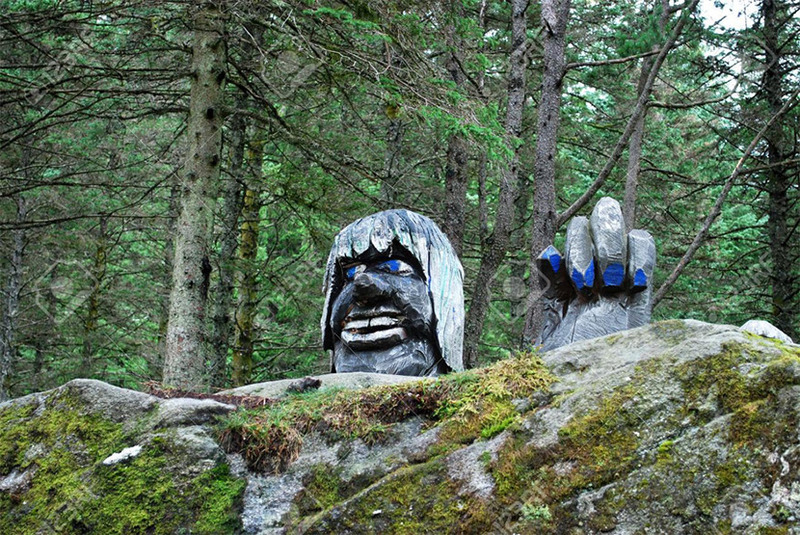 The place: Plunge straight into the belly of troll country in Bergen. The mists, myths and mountains of the city inspired its most famous resident, composer Edvard Grieg, to write March of the Trolls (Trolltog). 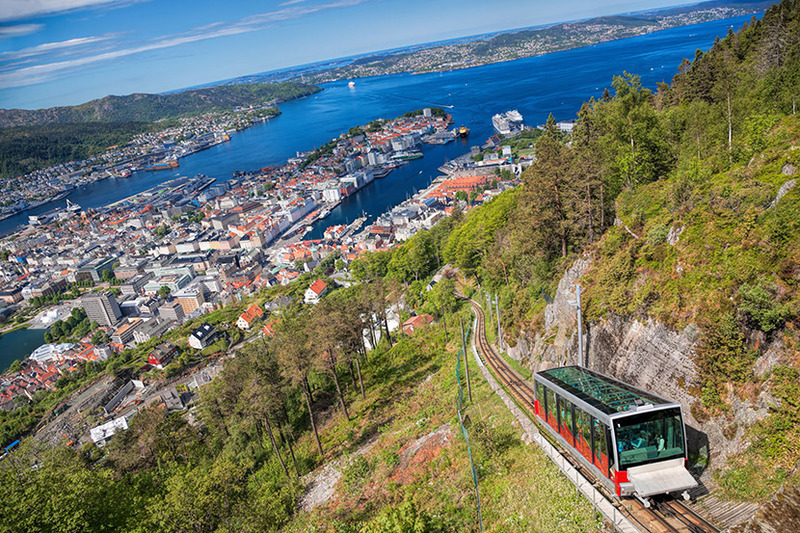 Ride the Fløibanen Funicular from central Bergen to the top of Mount Fløyen and you can meander through forest paths ripe with moss-draped rocks, huge trees, tiny wildflowers… and trolls of all shapes, sizes and colours. The stay: Great news for tired troll-hunters: just a five-minute wander from Fløibanen Funicular is historic restaurant Bryggen Tracteursted. Nestled deep inside the UNESCO-protected Bryggen area, it’s a must-do on any Bergen bucket list. Feast on traditional Bergen and Hanseatic fare with modern flare in the only ‘Schøtstue’ (a special assembly room built for ancient Hanseatic traders) left in its original location. P.S. 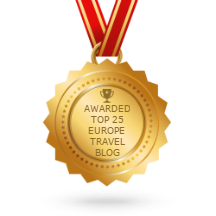 If you enjoyed this article, why not get the free Historic Hotels of Europe newsletter? …. Join us.